Delicious grilled broccoli recipe – pairs great with fish! Cut the broccoli into large florets and wash well. Drain. Toss with spices, oil, and aminos in a mixing bowl. 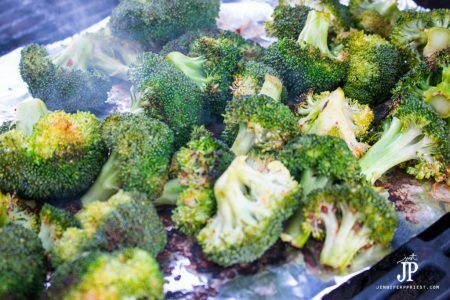 Line a hot grill with foil to prevent the broccoli from slipping through the rungs of the grill. Spread the broccoli evenly onto the foil. Close the lid of the grill and cook for 10 minutes. Remove the broccoli and serve with a squeeze of fresh lemon juice.